The Timberline Lock Cylinder Body for Thick Panel doors and drawers is ideal for when you're building with durability in mind. CompX Timberline has been a leader in secure, well-designed locks for kitchens, bathrooms and home offices since 1981, and has a solution for almost any home, office or industrial cabinet. With a specially built cam lock for 7/8-inch to 1 ¼-inch thick panel construction, you can lock up your important items even when you're using non-standard building materials. Simply screw the cylinder body in or out to adjust it for the thickness of your kitchen drawer, bathroom door or filing cabinet. 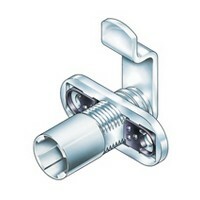 These low-priced thick panel cam lock bodies have the secure hold and ease of use that people expect from CompX. Both a bent arm and straight arm cam are included, which allows for three different orientations. Simply choose the best setup for your needs. Add a lock core, lock housing and keys from our selection of Timberline Lock Plug System products and you'll be ready to lock things up (just don't throw away the key.) WoodworkerExpress.com offers same-day shipping on all in-stock items with low prices so professional carpenters and handymen can stock up for future projects.